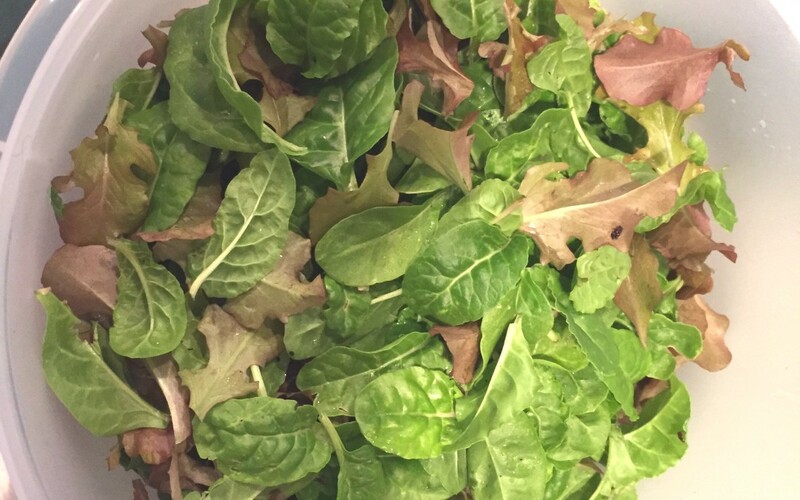 It was bitingly chilly outside, and our dog had no interest in my greens or cold-frame, but I stubbornly pinched off leaf after baby leaf, and I finally gathered enough tender lettuces to half-fill the salad bowl. The smell of the fresh greens intoxicated my senses, and my chilly fingers unthawed gradually in the warm kitchen as I reflected that next time I tried to venture into my winter garden, I was going to fortify myself with practically a gallon of hot chocolate, and array myself in the fleeciest, warmest sweatshirt and scarf that I own. I glanced at the thermometer sitting in our kitchen windowsill and read, “38 degrees F” [outside temperature]. Sigh. ….This seemed like a good idea, back in the summer when i was reading an inspiring book by Eliot Coleman (The Four Season Harvest), with exciting charts and lists of cold-weather vegetable varieties and planting dates for winter harvesting. Coleman lives on the northern seaboard, so I reasoned, “well, if he plants his spinach in August, i probably have a good two to four weeks behind him to do the same” (since I live in southern Missouri). It was great fun watching the baby seedlings thicken the dark, rich earth of my cold frame with their greening carpet. It wasn’t quite so much fun battling the onslaught of a blizzard in January, trying to pluck tiny greens out of an icy-bordered cement block recess. I know, though, from hard experience, that a steady diet of white sugar and white flour will kill you eventually, for lack of colorful, alive, vitamins, and that when I choose alive, fresh colors in spinach- and blueberry-gorgeous gourmet salads, my being thrives. It really didn’t take much time to care for my cold frame once we got the seeds sown; it is sheltered behind the two-story garage wall, and after several frosts, i finally covered it with a plastic drop-cloth, which promptly blew off and tangled itself into twists and rolls in the first subsequent strong wind. However, the strong little plants didn’t seem to mind too much, and thankfully, they received more rainwater that way, so, I say, all’s well that ends well. Smile. Thank Heaven for healing leaves.